Places of Fancy: Where Is 'Downton Abbey' Supposed to Be? Where Is 'Downton Abbey' Supposed to Be? Home to the Herberts and, in another universe, the Crawleys, Highclere Castle is faced with Bath stone, which was quarried 82 miles away and delivered by oxen. Normally you wouldn’t give a fig about ironing the morning newspaper or snooping about the post that came in for the lady’s maid. But with Downton Abbey, you will really, deeply care. This show has the uncanny ability of making the mundane look marvelous. 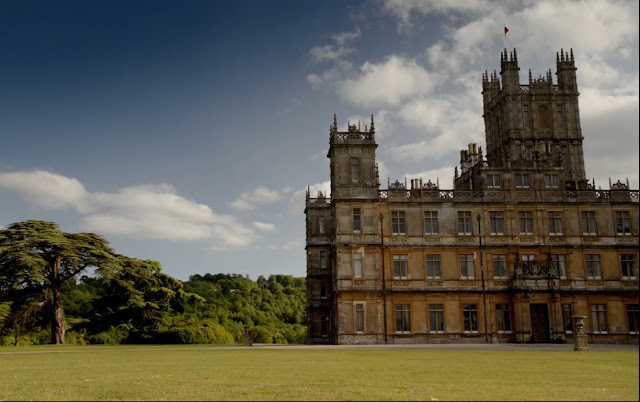 What you see as Downton Abbey on television is none other than Highclere Castle in England. Although the abbey must be fictionally located somewhere between Ripon, Thirsk and Easingwold in North Yorkshire, Highclere stands at the border of Berkshire and Wiltshire near Newbury in North Hampshire. With 300 rooms, including a vast double library and cavernous saloon that Downton Abbey viewers have come to know and love, Highclere is a rare colossus in real estate. The only thing vaster than the house is its parkland, all 6,000 acres of it. Highclere is home to the Earl and Countess of Carnarvon, patriarch and matriarch of the Herbert family, whose ancestors have owned the estate since 1679. If the name sounds familiar, that may be because the fifth earl of Carnarvon was the co-discoverer of King Tutankhamen's tomb. Renowned architect Charles Barry had just finished building the Houses of Parliament in London when the third earl of Carnarvon enlisted him to remodel Highclere. 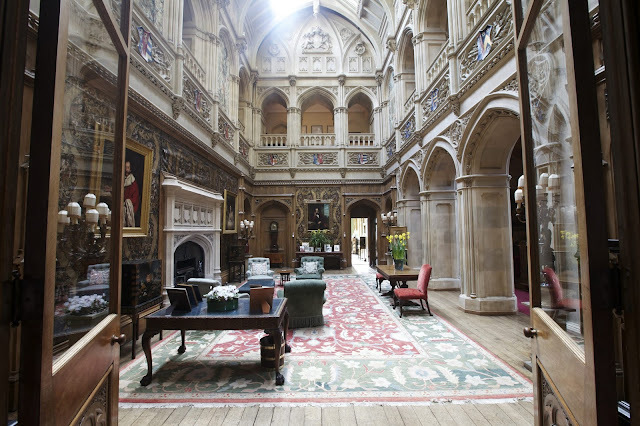 From 1839 to 1842, Barry transformed Highclere from a relatively small Georgian mansion to the opulent Jacobethan, Italianate-inspired palace that it is today. But even old money has its limits, and Highclere, with its leviathan inheritance taxes and behemoth repair expenses, can be very cost-prohibitive. The third earl, in fact, verged on financial ruin after remodeling the structure. The fifth earl’s marriage to Alfred de Rothschild’s heiress, Almina Wombwell, saved the castle for the Herberts, not unlike Lord Grantham marrying Cora, whose character may have been based on the sixth countess of Carnarvon, Catherine Wendell. Highclere costs $1.5 million to run every year. Time and again, the Herberts would be tempted by buyers like Andrew Lloyd Webber. Enter Downton Abbey showrunner Julian Fellowes, who happened to be acquainted with the current Lady Carnarvon, Fiona Aitken. Today, Highclere is used for both interior and exterior shots of the hit ITV/PBS series. Filming in Highclere can be such a beast, since the crew has to negotiate between walls of abject expensiveness and furnishings of shocking value. As Lady Carnarvon recounted, the Downton Abbey crew considered lighting candles below the Van Dyck painting that famously presides over the state dining room. One time, the crew broke something precious, and in another, ironed on a dining table. It should be noted that tables here are simply not a dime a dozen, one of them being that on which Napoleon signed his abdication. There is more liberty, motion-wise, in the ‘downstairs’ scenes, which are filmed in Ealing Studios 60 miles farther off. Homeowners always have the odd complaint with TV crew, but given how much Downton Abbey has become a cash cow, whining should be subdued. Lady and Lord Carnarvon have already secured a £1 million fee for the sixth season of the series. It is also no small measure of help that the show sends 1,500 tourists Highclere’s way every day. On filming-free months, weddings are big business for Highclere. Rates start at a not-to-scoff-at $22,000, according to The New York Times. With financially shrewd owners, Highclere should stand proud for years and years to come. The castle may have leased itself to the show, but it is the show that has given the castle a new lease on existence.